Finding good homes for good puppies. We are regulated by the State of Minnesota, USDA, Rice County, and AKC. Bill of sale and copy of the MN law. UTD on vaccines/ deworming's according to the puppies age. Puppy kit that includes: Health record, microchip brochure, quart sized amount of puppy food, variety treat bag, hip & joint treats, tooth brush, VOHC toothpaste, and a toy rubbed on litter mates and mom. Training information at pick up time to help you have a successful relationship with your puppy. Multiple pictures of your puppy and visits with the parents and puppy. Please scroll to the breed you're interested in to see what's available! ​1) Dianna- for female Sugar puppy. 2) Patti- for female Sugar puppy. Open to color. 3) Marla- open to gender. 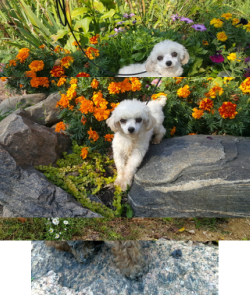 May transfer to future Malti- poo litter in hopes of a lighter color. 1) Sharon- for puppy. Open to color and gender. 2) Jon- for female. Prefers Dolce's puppies. 2) Christina- for male puppy. 3+4) Ricky- for two female puppies. 3) Third pick puppy available. 5) Joy- prefers female. Open to color. 4) Fourth pick puppy available. 6) Delora and Beth- for female puppy. These will be our only Yorkie- poos for the next 7+ months. ​Color: Black with white markings. 1) Karen & Mike- for first pick puppy. 1) Amy- for first pick puppy. We plan to have dark red toy poodle puppies within the next 6 months! Please reach out to us now if this interests you as this will likely be one of our only litters of reds! Color: Black, black with white markings. This will be our last litter of Peke-a-poos. Luna will be retired after this litter! Visit! You're welcome by appointment. ​If you decide to purchase a puppy we take cash, check, Pay Pal, debit and credit cards. Fee applies with cards.